Vegetable modified cellulose, vegetable modified cellulose gum, vegetable stearic acid, vegetable magnesium stearate, silica, vegetarian glycerin. For Intensive Use: Take 3 tablets up to twice daily with water. For Daily Maintenance: Take 1 to 2 tablets daily with water as needed. 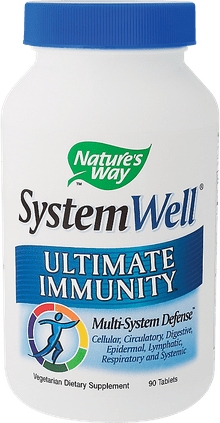 System Well Ultimate Immunity from Nature's Way is a comprehensive, all-in-one immune formula that includes all of the Big Guns from the vitamin, mineral, herb, mushroom and probiotic realms. For people who want immune support but don't want to juggle a bunch of different products, System Well Ultimate Immunity is a great choice. You'll get a wide range of immune-enriching nutrients in effective, robust potencies. Use System Well Ultimate Immunity to help speed recovery when you're ill or, at a lower dose, for daily and ongoing immune system support. 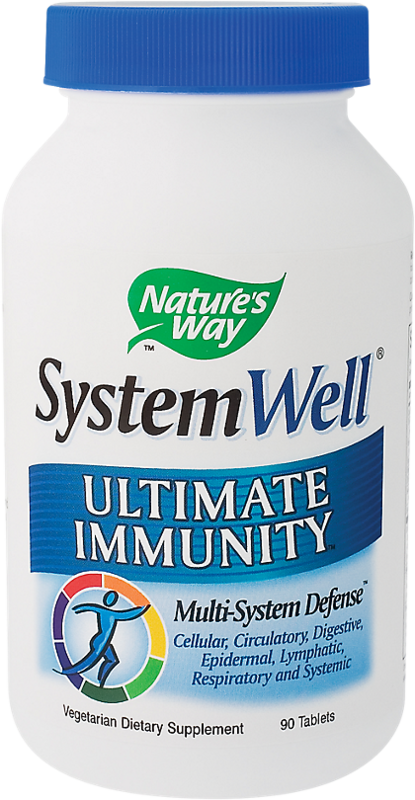 In this respect, System Well Ultimate Immunity is similar to, but much less expensive than Source Naturals best-selling Wellness Formula. Take 3 tablets up to twice times daily with water when immune response may be compromised. Take 1 to 2 tablets daily with water as needed for immune system maintenance. If you are pregnant or nursing consult a healthcare professional before using this product.